Here is another composition in the Joan Miró mode. I have been building a library of icons throughout the years and have been experimenting with ways of arranging them. I prepared the watercolor paper with random washes of pale yellows and blues. On the lower third of the paper I placed a cone with a small horizontal strut balanced on top. As soon as I realized it was a scale, I had to draw a thumb on it. I placed the other hands and eyes where they seemed to belong. I’m not sure if there is a narrative that accompanies this composition. But I like it anyway. 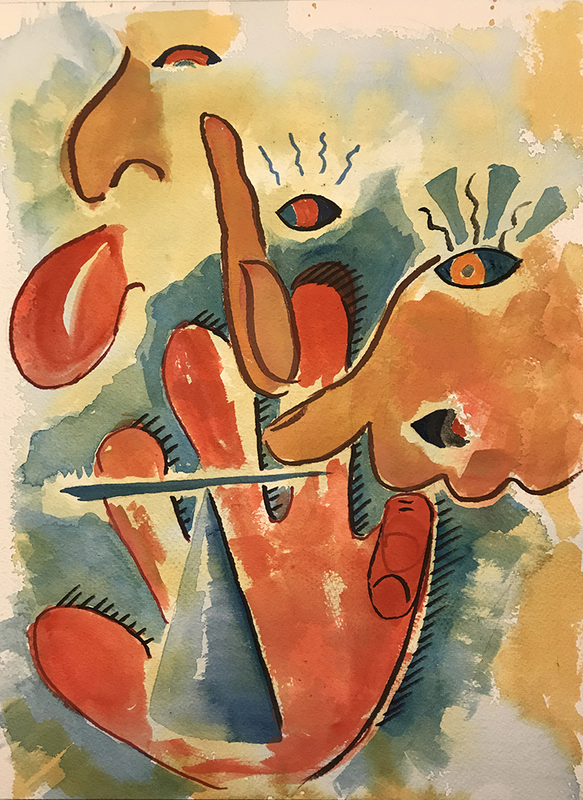 This entry was posted in Personal Stories and tagged abstract art, artistic process, creativity, icons, Joan Miró, painting, surrealism, visual arts, watercolor. Bookmark the permalink.